Friday: 5pm-7pm, opening session. Followed by dinner. Saturday: 9am-11:30am, morning practice; 11:30am-12:30pm: Lunch provided. Sunday: 9am-11:30am, morning practice; 11:30am-12:30pm: Lunch provided. Followed by dinner. Monday: 9am-11:30am, morning practice; 11:30am-12:30pm: Lunch provided. Cancellations: There are no refunds for this retreat if student cancels. Yogis enjoying the view after lunch at Chilkat Retreat Center. NEW! Stay on yoga retreat site. CHILKAT INLET RETREAT has 4 yurts available. Each offers 1 queen bed, shower, outhouse, hot plate, electric kettle and access to kitchen in Community Building. Sunday: 9am-11:30am, morning practice; 11:30am-12:30pm: Lunch provided. 4:30pm-6:30pm: Restorative. Followed by dinner. Practice in the Yoga Yurt on the Chilkat River. Morning meditation in the Meditation Building. ​Students dine in the Lodge on the Chilkat River. Fresh, local foods are prepared by our chef, Sarah Bishop of Old Field Kitchen. ​Two dinners and three lunches are provided. Students are responsible for their own travel and accommodations, including local travel to and from the retreat center each day. 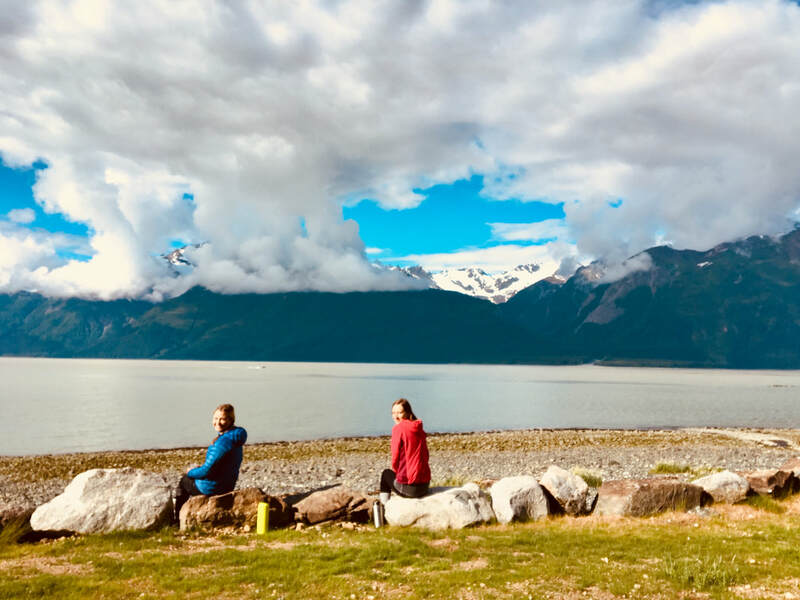 Outside magazine placed Haines in the Top Ten places to live, and when you arrive in the Chilkat Valley, you’ll understand why. At the upper-most end of the longest, deepest fjord in North America, this coastal gem has it all: glacier-studded peaks along a magnificent river valley open to the warm summer sun and a blue-green ocean vista. The area is home to the largest gathering of Bald Eagles in the world, and opportunities to view wildlife abound. The Native artistic traditions provide a magical foundation for the town, co-founded in 1879 by John Muir. That tradition lives on today and many consider Haines to be the “artist’s community” of Alaska. We’ll be practicing yoga in a beautiful yurt in the heart of this wilderness. Our retreat center is in one of the most treasured locations in the region, snugly nestled along-side the Chilkat inlet. The center is only an 8 minute drive from town where you’ll find hotels, restaurants, markets, cafes and art galleries. There will be plenty of time for hiking and exploring the natural wonder of the area. We recommend arriving a few days early and/or staying a few days after. We'll have recommended outings for you before you arrive. For a first-hand account, read Aaron's blog published by Yoga Journal A Journey Bigger Than Ourselves.